While inlays and onlays cover the chewing surface of the tooth and fillings fill in the empty interior space of the tooth, crowns completely cover every visible part of the tooth - which is why they are sometimes referred to as "caps." If our doctors decide that you are in need of a full crown, there are a few different options for the repair of your tooth. 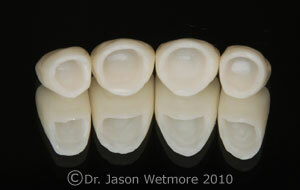 These options include a full porcelain crown, porcelain fused to metal, or a full gold crown. We will discuss these options with you and help you determine which type of crown is the most appropriate for your situation. You can be comfortable in knowing that your new tooth will be virtually unnoticeable and will flawlessly complement the rest of your smile. 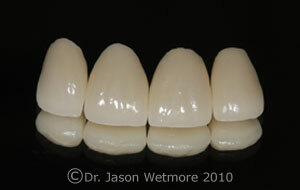 Our in house laboratory technicians excel in the fabrication of metal free all porcelain crowns. They painstakingly hand fabricate your new teeth using the most durable and esthetic porcelains available. We also have CAD/CAM milling machines that we utilize to mill Emax and Zirconia crowns when indicated. By utilizing our family owned and operated dental lab, we are able to keep the cost of our all porcelain crowns relatively close to that of our other crowns so that cost will usually not be a factor in choosing the correct restoration for you. When we have decided to proceed with a full crown restoration, we will usually set aside two appointments for the entire process. Although sometimes there is a need for a third visit to ensure a proper fit.